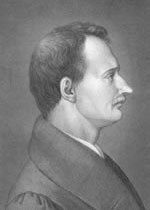 Karl August Georg Maximilian Graf von Platen-Hallermünde studied literature and languages at FAU, which he praised saying: ‘Our university is without doubt the most excellent in Germany, at least in terms of spirit and ingenuity’. Under the influence of Friedrich Rückert and Friedrich Wilhelm Schelling, he devoted his studies in Erlangen to the culture of the Orient. He is admired by literary critics for his poetry, while his comedies and ballads were well received by the general public.